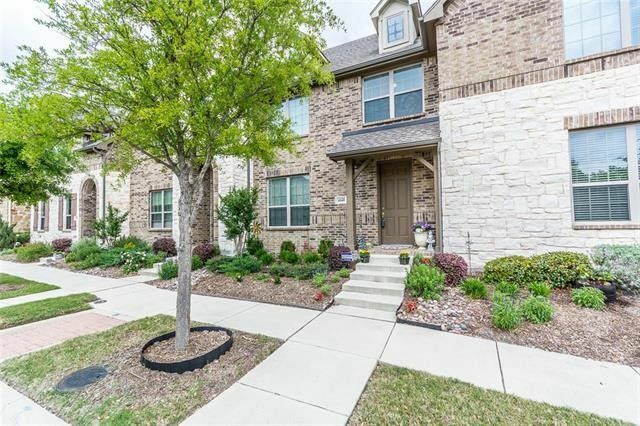 Stunning & spacious townhome in an exceptional neighborhood with schools in the highly sought after Allen ISD. Gorgeous curb appeal. Hardwood floors in living & dining, spotless carpet upstairs. Beautiful kitchen open for entertaining has an abundance of cabinets with under & over lighting, stainless steel appliances, granite counters & breakfast bar, gas cooktop & large walk in pantry. Half bath downstairs. Elegant wrought iron staircase leading to a great reading area loft. Large master bedroom with HUGE closet & ensuite bath with dual sinks, granite vanities. The guest room is a great size with access to a separate full bathroom. An oversized garage. Community amenities, clubhouse, pool, lake & greenspace. Directions: From Sam Rayburn Tollway go North on Lake Forest Drive. Turn left on McKinney Ranch Pkwy. Turn left on Pecan Trails into the community. Turn Left on Soapberry which turns into Pecan Bend and then turns into Mesquite Drive. Turn Right on Blackjack Oak. Home is on the left with sign in yard.